JAKARTA (JP): The Indonesian government announced on Fri Jan 2 that the new tourist visa policy will start on Feb. 1, 2004 despite strong opposition from the tourism and hospitality sectors. Justice and Human Rights Minister Yusril Ihza Mahendra said that President Megawati had approved this month the presidential decree on visas. The decree grants a "visa free" facility to tourists from the following countries. are eligible for a "visa on arrival" facility. The new policy cuts the length of the "free visa on arrival" stay from 60 days to 30 days. The new "pay visa on arrival" would also only allow visitors to stay here for 30 days. Visitors from countries with visa-on-arrival facility will have to go to a new counter to have their passports stamped with the on-arrival visa at a cost of $25 US, before going to the immigration clearance desk. Meanwhile, visitors with the visa-free facility or visa's obtained before, will be able to proceed directly to the immigration clearance counter. Yusril said that it would take only 7 minutes For immigration officers to process a visa-on-arrival request. Then of course you have the usual 1 hour or more wait in immigration. So can you imagine the chaos if a 450 seat 747 lands. Or 3 planes at once as is the case most afternoons when GA arrives from Melbourne. the arrivals hall? - or will they allow you to pay in your currency at the usual extortionate airport rate. Indonesia claims the reason for the new policies is to bring Indonesia in to line with other countries. I.e. you give us free entry and we give you free entry. It is extremely difficult for Indonesians to get a tourist visa to Australia for instance. They are rarely granted and Indonesians must pay 380,000 Indonesian rupiah ($63) for a short term (3 month visa) application. The fee is non-refundable - and you cannot ask for a reason why your application was denied. Bulan Bintang, (PBB). A moderate Muslim party, member of the axis group started by Amin Rais. Yusril was a short time cabinet minister during the Wahid presidency. However Wahid soon fired him for his outspoken criticism against the administration. Yusril is now Justice and Human Rights Minister in the Megawati cabinet. He is as a presidential candidate this years presidential election. sad day for the tourism industry and the people who rely on it for a living. It has been estimated by various agencies that the move will reduce the tourist numbers to Bali by up to 35%. Bali has never recovered from the tragic night club bomb explosion and now the poor Balinese people have to bear this burden from the Jakarta government. Ms Erna Van Cazant says it is so stupid, how can we rent our villa to out Dutch guests when they will have to apply for a visa. But Ms Erna, you won't have to wait in the 5-7 hour queue at the airport. Maybe the government is doing you a favor. BALI Fri Jan 2 2004: At 0459 we were all shaken out of our beds by a substantial earthquake. Friend Onney was the first to call out and we all ran to the street, The house was shaking so violently we kept hitting the walls as we ran. There were 3 people staying in the house apart from Jamal and John. Onney and Amang from Lombok and Jamal's brother Dadan from Bandung. The quake lasted around 10 seconds and was quite violent. after telling lots of extra boring, previous earthquake stories, we returned to the house to inspect for damage. Fortunately there was none. The epicenter was near Lombok, 78 km from our house. The exact position -8.40 degrees latitude and 115.95 degrees longitude. The magnitude was 5.4 on the richter scale. The seismic monitoring station in Bali registered 6.2, we feel this to be a bit high. The worse hit area was around the Candi Desa area in east Bali. Where many buildings were damaged. It was reported 1 man died of a heart attack and a boy had 2 legs broken in the panic. condition. I just read the AFP report and it seems very badly informed. Fortunately in Desa Ban (our Project Village), none was injured. I guess that is mainly because all of their houses are single room, majority only made from bodeg (woven bamboo) generally with zinc roofs. JAKARTA Tues Jan 06 (AFP): Two minor earthquakes hit Indonesia's holiday island of Bali today, four days after a powerful tremor which damaged thousands of buildings. The deep-sea quakes, registered at 3.7 and 4.1 on the Richter scale respectively, occurred almost simultaneously Tuesday morning but were "hardly felt" by residents, said Budi Waluyo of the Meteorological and Geophysics Agency (BMG) in Jakarta. There were no reports of casualties or damage. Many residents of Bali, particularly in the Karangasem district on its eastern tip, are still afraid to return to their homes which were damaged by last week's quake, Waluyo said. Indonesia does not belong to the American lead, International seismic monitoring service, the nearest is run by the Australian government on Cocos island, 1274 km from Jakarta or 2038 km from the KHO. The strength of the quake was registered as 5.4 by the Cocos monitoring station. Bali has a monitoring station and belongs to the ASEAN network. Bali suffers earthquakes regularly, the worse recorded was on 21st of January 1917 north of Singaraja, Bali, with over with over 15,000 people dead. Other major quakes occurred in 1830, 1888 and 1979. Bali also has suffered many volcano eruptions and Tsunami (tidal waves) in 1977 and 1994. An earthquake of magnitude 7.6 occurred off the SE coast of Java Island, Indonesia, at 01:17AM local time on June 3, 1994 The epicenter was at 10.5°S, 113.0°, about 240 km from the nearest coast. The shock was felt on east Java island and on Bali Island, but only awakened 10-20% of the inhabitants. No damage was reported on land. About 50 mins after, a large tsunami struck SE Java and SW Bali, causing serious damage. 223 dead, approximately 400 were injured, and over 1000 houses were destroyed. At 3 years old you believe in Santa Clause. At 8 you no longer believe in Santa Claus. At 60 you play Santa Claus. 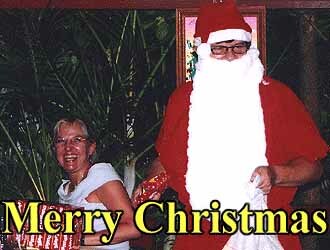 Christmas Eve 2003: we made a party at Warung Sobat. Santa Claus arrived with a pillow slip full of pathetic gifts for the poor customers. Pak Made made special dinner for an inclusive price of $5. Excellent. Just before midnight the restaurant was darkened and only lit by candlelight as Jamal. 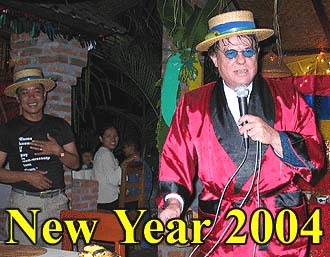 with guitar sang "Silent Night"
"I will stop smoking at NY"
New Year Bali: We held our New Year party at Warung Sobat the restaurant was totally full with happy revelers. John & Jamal did their world famous "Lucky Draw" act including the "Mummy Wants Banana" party game, to the delight of the attendees. Onney, Dadan and Jamal all entertained with songs. and gladdies were handed out just before midnight. This is her latest of thousands of attempts. The first was years ago when her mother wanted her to be a Nun. Ines swore (no wonder she never became a Nun) at midnight New Year she would give up. She even has a bet with Jamal for Rp 1,000, that's less then 20c. Bali KHO: Along with the KHO's constant program to improve it's services, we have taken delivery of a brand new computer. Actually the old trusty Pentium 166 blew up and the mother board was dead. So we actually purchased a new K7SOM+ AMD Athlon XP/Durian season motherboard which runs at an amazing 1300 million bits of stuff a second. Wow! We ended up with the new case and power supply because the new mother board was too small to fit in the old case. Although I think the new case is far to big for the 20 cm x 20 cm mother board. Also a new 40mb hard drive, with the old 20mb hard drive running in backup. The graphics are a huge improvement on the old computer, with the mainboard 256-bit 3D AGB adapter. We are still using the 2 old CD drives, monitor, modem and printer. Costs were motherboard, power supply and case $177 and the 40mb HD $90. A few meters down the road from Warung Batavia we have just discovered new Chinese restaurant run by Penny and Richy. Both in Australia for many years, Richy working as a chef. in Indonesia. There are many Chinese restaurants in Denpasar aimed at rich Chinese with Jakarta prices, but the food is always disappointing. Warung Lumbung Padi is a real find. We love it! The menu is typical international Chinese but not as extensive. Prices are around $2-3 per dish. They have fruit juices, beer & even cappuccino. The food and service is excellent, we thoroughly recommend you pay a visit. 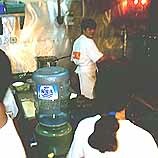 Chinese chef Ritchy worked as a chef in hotels and restaurants in Perth & Sydney, Australia, for almost 20 years. Thank Golly it's all over for another year. After NY relaxing house guests Dadan (Jamal's brother) and old friends Onney and Amang (from Lombok) at Villa Uma with Erna.